HTC One E8 might be not be a perfect second flagship device that users would really like to own, but with its almost similar aesthetics like the big sibling, One M8, the plastic body E8 is a pretty decent catch, and has decent hardware specs for the big bucks it asks to shell out of your pocket. The device comes with a 5-inch Full HD (1920 x 1080 pixels resolution) display, 2GB of RAM, 16GB of internal storage with an option to increase the storage up to 128GB via microSD card. It touts the 13MP rear shooter, as well as 5MP front snapper to take ultimate selfies. For the HTC One E8 users, we wanted to share how you can improve your experience by using the tiniest of the tricks that your smartphone is capable to do. Here are few FAQ, tips and tricks to get you started in improving the user experience on the device. 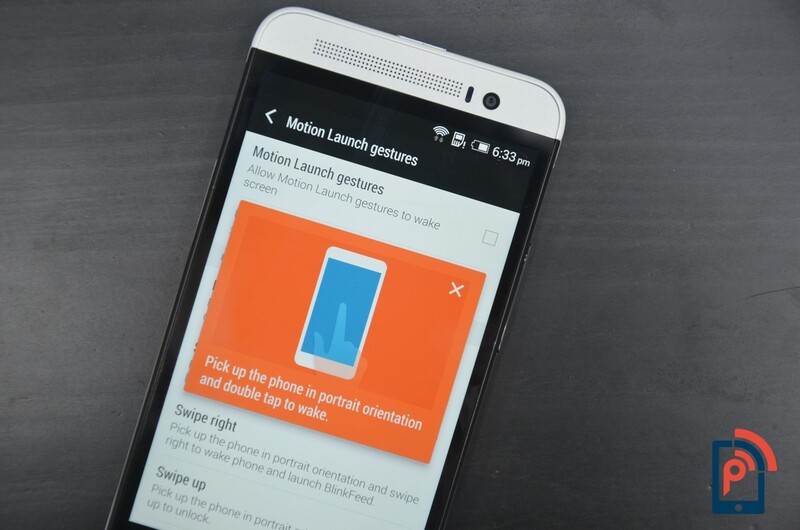 How to check if the Motion Launch gestures are enabled? How to use HTC BlinkFeed even when I’m offline? Why there are different color themes for different apps? How to change the color theme of HTC BlinkFeed and apps? How to hide or remove the lock screen? How do I switch between HTC BlinkFeed and the home screen app that I downloaded? Do I need to insert a SIM card in order to use the HTC Transfer? The weather clock widget on my E8, sometimes appear/disappear on HTC BlinkFeed? When does HTC BlinkFeed auto-refresh the contents on Home screen? How to fix if the screen is not rotating? How do I share my phone’s Internet connection with other devices? Does HTC One E8 support remote controlled accessed of TV? How do I enable developer’s options on my HTC One E8? I forgot my lock screen pattern on HTC One E8? How do I save my files on the microSD card instead of the phone storage? How to make status updates and birthdays appear on my Caller ID? I am not receiving text messages from contacts that use iPhone? 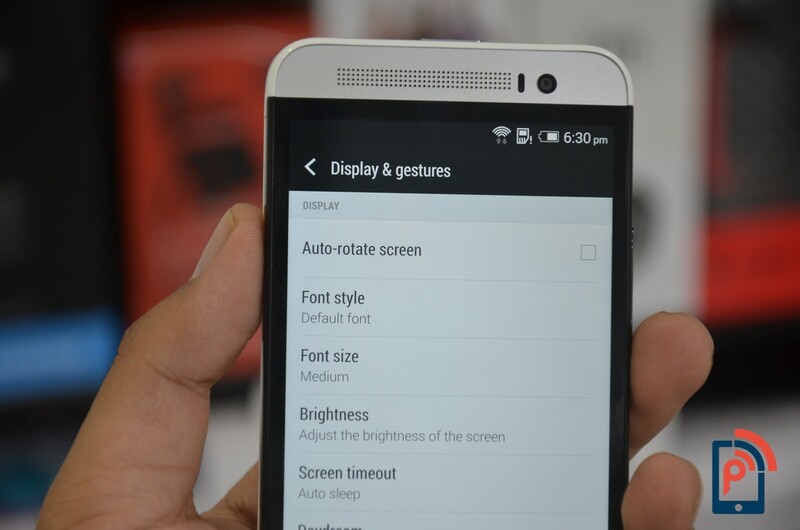 In settings option, go to display & gestures, tap Motion Launch gestures and make sure this feature is turned on. If Motion Launch is already on but your phone is not responding to your gestures, see the possible causes below. There was no motion gesture before the finger gesture. Make sure to lift the phone first before doing the finger gesture. Length of swiping was too short. Swipe a longer distance across your screen. When swiping up to unlock the screen, you didn’t swipe from the bottom half of the screen. When swiping down to use the Quick call feature for voice dialing, you didn’t swipe from the upper half of the screen. If you don’t have a nano SIM card inserted, Quick call will not work. Yes, HTC BlinkFeed displays cached content when you’re not connected to the Internet. In order to do that, you need to go to HTC BlinkFeed settings and tap Offline news reading to set whether to cache text only or full articles for offline reading. Depending on the type of app, some apps are predefined with a theme of 4 colors by default. Blue defines the communication apps such as Mail and Messages, while other colors like Green defines the data-centric apps such as HTC BlinkFeed and Weather, Orange is for the entertainment apps such as Gallery and Music, making Black color for the settings option. In Settings, you can choose a preset theme that has a different set of colors. You can’t choose your own colors. Go to Settings, and then tap Personalize. Select the theme option. Now tap a thumbnail that has the set of colors you like, and then tap Apply. Tap No to keep your current Home wallpaper, or tap Yes to use the selected theme’s wallpaper. Yes, if you prefer not to have a lock screen, you can disable it in Settings. Go to Settings, and then tap Security > Screen lock. Tap No lock screen. Both the security and lock screens will be disabled. Go to Settings, and then tap Personalize, then, tap on home screen, and choose which home screen mode you want to use — the home screen app you downloaded or HTC BlinkFeed. No, HTC Transfer uses Wi-Fi to transfer your data from your old phone to your new phone. On your old phone, you can either use a Wi-Fi or data connection to download the HTC Transfer Tool. You can refresh HTC BlinkFeed anytime by manually pulling down on the screen. As well as there are few things set to default by company, which includes, when your phone is on Wi-Fi, HTC BlinkFeed refreshes content every hour. Plug in your phone while connected to Wi-Fi and HTC BlinkFeed refreshes every fifteen minutes. If you’ve set HTC BlinkFeed to auto-refresh using your mobile data or Wi-Fi connection, content will be refreshed every two hours when the phone uses data connection. While some feeds from apps like Calendar may only happen once per day. If the screen doesn’t rotate when you turn it sideways, first make sure that the Auto-rotate screen option is selected in Settings > Display & gestures. If Auto-rotate screen is already selected, try recalibrating the screen if the screen orientation doesn’t respond properly to the way you hold your phone. Go to Settings, and then tap Display & gestures. Place the phone on a flat and level surface, and then tap Calibrate. You can share your phone’s data connection through USB, Wi-Fi, or Bluetooth. Go to Settings, tap More, which will open the Mobile network sharing, and then choose whether to share via USB tethering, Portable Wi-Fi hotspot, or Bluetooth tethering. Phone models without the infrared sensor don’t have the remote control access of TV, meaning the E8 doesn’t support the IR Blaster. Though, with the HTC Mini+ users can take have the remote control access. As you can easily pair HTC Mini+ with your phone, and use HTC Mini+ as your TV remote. If you want to develop apps for your phone, you can enable developer’s options in Settings. Now you need to go to Settings, and then tap About section, leading you to the Software information, and then tap More. There, you have to go to Build number, and tap 7 times or more until you see the message “You are now a developer”. When you return to the Settings screen, you’ll see the Developer options setting. 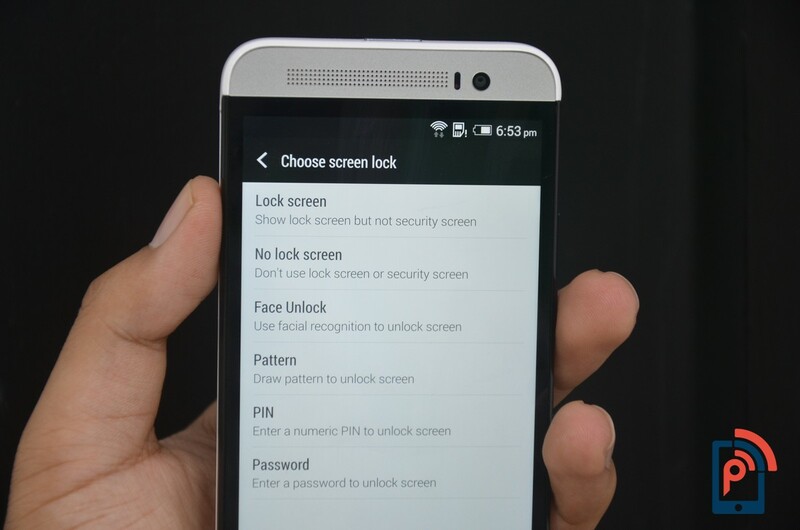 If you’ve forgotten your screen lock pattern, you have up to five attempts to try and unlock your phone. If this fails, you can unlock the phone by entering your Google Account user name and password. On the security screen, enter your lock pattern. After the fifth attempt, when you’re asked to wait for 30 seconds, tap OK. If the display goes off, press the Power button to turn the display back on, and then unlock the screen. Now tap the Forgot pattern? Button when it appears. Enter your Google Account name and password, and then tap Sign in. You’ll then be asked to choose a new screen lock. If you no longer want to have a screen lock, just press back button to exit the Security screen. Certain apps can be configured to save files on the microSD card. You need to go to the Settings, and then tap on Storage. Tap Storage settings. Now to set all the listed apps to save to the microSD card, tap on Update all option and go to SD card storage. Or just tap one of the apps, and then tap SD card storage. If you’ve signed into your Facebook or Twitter account, you’ll see the caller’s latest status update. You may also see the caller’s upcoming birthday if the event is saved on your phone or if you’ve signed into your online account such as Facebook. If you created a task in the Tasks app and linked it to a contact, the task will appear when the contact calls and if the contact has no recent status update. If you’ve just migrated your contacts from iPhone to your HTC phone, your contacts may still be texting you through iMessage service and not through SMS or MMS. To receive their text messages on your HTC phone, you must turn off the iMessage service in your iPhone settings. If you have other Apple devices, you also need to turn off iMessage on them. Or better, you need to go to your Apple support profile on the web and unregister your iPhone and other Apple devices.